Lamb doner. Chicken tikka masala. Turkey burger. Doughnuts. If you think this doesn't sound like diet food, then think again. 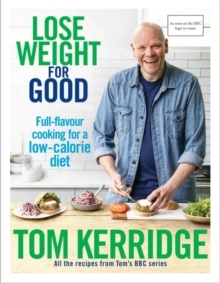 Featuring ALL the recipes from his BBC2 TV series, Tom Kerridge shows how you can enjoy all your FAVOURITE FOODS and still LOSE WEIGHT with his LOWER-CALORIE DIET WITH A DIFFERENCE. Michelin-starred chef Tom Kerridge has been developing top recipes for nearly three decades and knows how to make things taste good. He also understands how much willpower it takes to shift unhealthy excess weight, because he has lost over 11 stone in the last four years by following a low-carb diet. Now Tom is turning his attention to helping food-lovers who have chosen a lower-calorie diet as their own route to weight-loss. This is a lower-calorie diet with a difference - it's based on hunger-satisfying portions of delicious, lower-calorie dishes that taste amazing. The focus is on the food that we can and should be eating to lose weight, which is easy to make and won't make you feel as though you are missing out. Recipes include Southern-style chicken; One-layer lasagne; Chicken tikka masala; Lamb doner kebab; Beef stroganoff; Sweet potato and black bean burritos; Sticky pork chops; and Baked doughnuts with sweet five-spice dust. As Tom says: `It's impossible to stick to a diet if the food you're expected to eat is boring and doesn't fill you up. So I've developed lots of tasty and satisfying recipes that people will love to cook and eat, but that will also help them lose weight. I truly believe that this attitude works. I've been there myself and now I want to help others get there too.' By adopting a new, healthy approach to eating you really CAN lose weight for good.